The Bootleg Series Vol. 8 – Tell Tale Signs: Rare and Unreleased 1989–2006 is a compilation album the official “bootleg series” of rare and unissued recordings. It was originally released as a double, and (limited edition) triple album. It was later released as a single album, consisting of disc one of the double set. 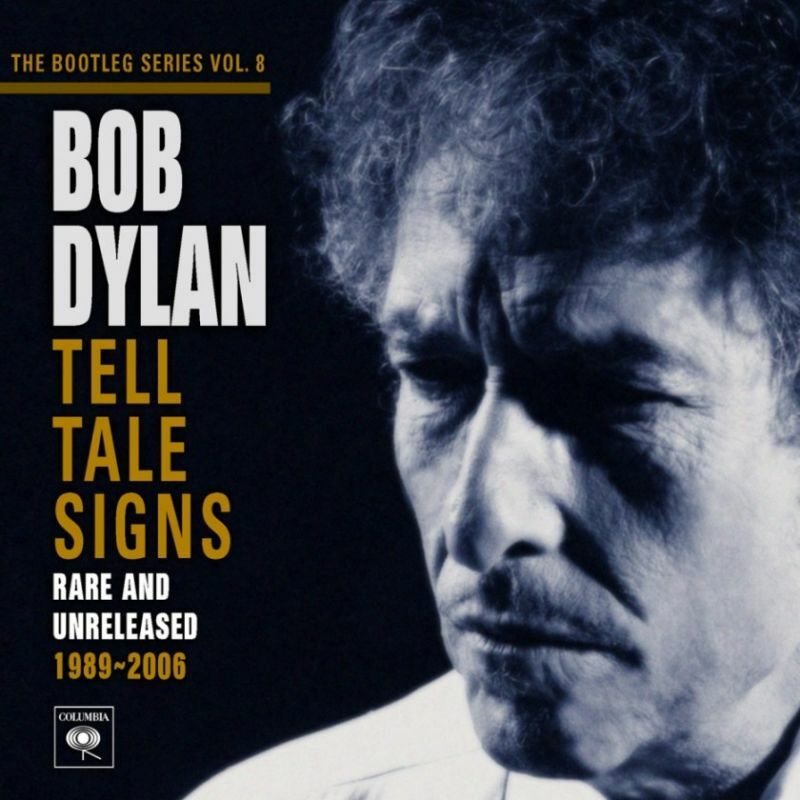 The three-disc version of Tell Tale Signs includes a detailed 56 page book annotating the recordings by Larry Sloman, and a book of photos of “The Collected Single Sleeves of Bob Dylan” drawing on Dylan releases from around the world, plus a 7″ vinyl single with two tracks from the set: “Dreamin’ Of You” and “Ring Them Bells”. The bootleg series—the commentary to the canon—did finally catch up to the latter phases of his recorded output. Again it was a revelation and a fantastic collection of alternative versions and outtakes. It is a strong confirmation of the sky-high quality of Dylan’s latter-day production. The album spans the recording sessions for Oh Mercy, World Gone Wrong, Time Out of Mind, and Modern Times as well as a number of soundtrack contributions and previously unreleased live tracks from 1989 through 2006. The collection also includes a track from an abandoned album Dylan had started to record with David Bromberg in 1992, and Dylan’s duet with Ralph Stanley, ‘The Lonesome River’. Although Under the Red Sky, Good as I Been to You and Love and Theft were all recorded during this time period, no tracks from these sessions are included on Tell Tale Signs. An alternate version of “Series of Dreams” was included on Vol. 3 of the Bootleg Series. “Dreamin’ Of You”, an outtake from the Time Out of Mind sessions, was offered for free download on Bob Dylan’s site and was also sent to radio stations as a promotional single. In its first week it opened with #6 on the Billboard 200, selling over 600,000 copies to date and becoming Dylan’s 17th album to open in the top 10. The live tracks on the album are so fantastically good that I hope for a Never Ending Tour compilation soon, and please let it be extensive. A 10 cd box would be good. Remember, there is no such thing as a definitive version of a Bob Dylan song, just a snapshot of the great man’s prevailing mood. The Snapshots on this collection are great! Disc Three was not that bad either: “Duncan and Brady”, “Things Have Changed (great song) and “Red River Shore” are my favourites. A rip off, for sure. But some rip offs are better rip offs than other rip offs. My favorite is the rework of “Someday Baby.” This is the ultimate of all of the great Bob Dylan “kiss off” songs. I love the way the drums start this song off, setting up almost a march, and I love the way the fingers dance delicately along the frets in some of the guitar solos, always getting a great resolve from the bass. The drums never stop driving the song forward. The vocals are pure…. he has had about as much of this as he can endure….you say you love me…. but it can’t be so. The guitars all work together beautifully. Living this way is not a natural thing to do…. Why was I born to love you? Huck’s Tune is another great one. Dylan’s Under the Red Sky album does have Oh Mercy’s leftovers “Born in Time” and “God Knows” — another very under-rated album. It’s a revelation, of course. More than even the last release, this one had me scaratching my head before it was released. But my, what a wonderful collection – how many people can do a career retrospective on a part of their career that just passed the way Dylan did? I look forward to every bootleg series release, there are always gems revealed. And I agree, volume 8 is fantastic! This is also my favorite Dylan album, with disc one a masterpiece, disc 2 very good, disc three a huge ripoff at the time, but I got it for free later. Columbia Records was really trying to gouge the Dylan fan base with the 3 disc set, over $100 dollars in the US at the time of its release, while the 2disc set sold for a regular price. I still listen to disc 1 all the time…just amazing stuff. It really made me question the original track selections from the discs these songs were taken from. Today I saw Richard Thompson, Billy Bragg, Chris Isaak, and a bit of Vince Gill’s fun band of Nashville session musicians at the Hardly Strictly Bluegrass Festival in San Francisco. Beautiful day and rip-roaring sets by Thompson and Bragg. I would have loved to be able to attend “the Hardly strictly bluegrass festival”, lucky you! – Thanks for the comments! Never got tired of playing this cd. Easily my favourite and most played volume of the Bootleg Series to date.